Small and powerful 50cc pit bikes. With buying 50cc pit bikes you need to know if the advice is good. Bike magazines are generally written by people who do this for a profession and have a great balanced opinion. Forums can give great free advice, but don’t take every item and opinion to heart; emotion can play a big part in the forums, and a great dirtbike can get bad posts by a couple of loud individuals. Take an unbiased approach, and read up thoroughly on your model of mini moto reviews, from free and paid articles. There is plenty of advice and opinion out there, but ensure you cut the wheat from the chaff, and it should plain sailing. 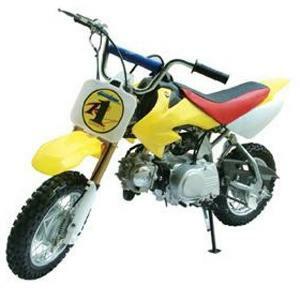 50cc pit bikes are ideal for young children. One that fits the bill is the Youth Pee Wee 50cc dirtbike or pitbike. It’s a point-and-go, machine with auto-start, and no clutch or gear operation at all! Still with a four-stroke engine, and the guys who designed this have really thought about what kids want. Firstly this dirt bike has stabilizers, which are easily removed once your child is happy and practiced with their skills. It’s a proper 50cc, with an auto transmission. Oil Tank of 2.5l and a Max Load of 255LB, funky graphics with disk and drum brakes. (Plus warranties from registered stores), so this will be ideal for first time dirtbikers. Another bike you might want to check over is the Mini Trail 50. 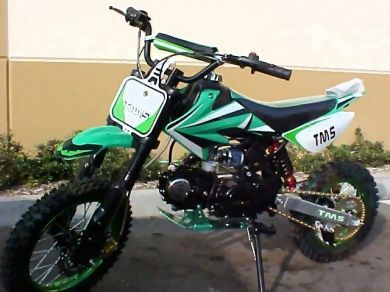 A well built ride with a 49.7CC motor (even though it’s titled as a 50cc pitbike). The four stroke can get upto speeds of 40 mph that’s held in a steel frame. Kick start and a big tank to ride almost all day. But what we really like is all the safety features, such as an exhaust heat shield (for its heavy duty chain), and a handlebar kill-switch. 50cc motocross bikes are numerous from the newbies Kawasaki klx 50 to the Ktm 50 Senior Pro Series. Or perhaps you would love the LEM R2 2 Stroke 50 Jr? This Italian pitbike is quick, they are more for racing than heavy duty tracks, but you get the idea. Parts for the LEM models should not be too hard to get – but do check this within your local area. In most cases you may be only keeping these 50cc pit bikes for a few years before your child graduates to bigger engined bikes. So look after them and you can sell a dirt bike for what you "almost" bought it for – this should be your strategy. 50cc air cooled engine, EPA Approved, with a warranty (often 6 months or greater). A toolkit and handbook, (if it’s a used dirtbike, maybe a few spares as well). If the pitbike is “new” you may need a complete MSO (Manufacturer's Certificate of Origin), required for registration at your local Dept. This should never come with the bike, it will be mailed separately, then see enclosed manufacturers instructions with the bike –and keep this document safe. Plus don’t forget all those motocross bike safety features, and you’ll need to budget for a helmet too. If you get all that, and a quality bike (no matter if it’s used or new) you’ll have a great time. Pit dirt bikes are an exciting and versatile bike. 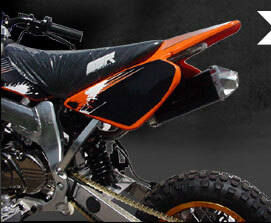 A 50 pit bike is light and robust; the pit bike engine has power, and can transfer this to the dirt track. You can buy pit bike ebay motors from classified adverts, and don’t forget to check those pit bike tyres are in good condition too as its all extra costs later on.